A tip I thought i'd share, apologies if i'm telling you something you already know but i was so relieved to crack this one. I found some play on the drivers side wheel bearing and decided to adjust it, but I was really struggling to remove the wheel bearing cap, after spending about 20 minutes trying to pry into a non existant gap with various sized screwdriver tips and hitting the cap from all angles I finally gave up as it just wasnt moving at all and the cap was starting to show signs of battle damage. I searched on google for tips and saw loads of different posts from people on lots of different owners forums for all types of cars describing the very same struggle and discussing ideas about various pullers and other methods so I realised I wasnt alone with my frustrations. Anyway I went back to the task the next day and after another 15 minutes of getting nowhere I sat staring into my toolbox trying to figure out what I could possibly do, so I tried what you see below, using a hammer as a fulcrum I inserted a large flatblade screwdriver into the groove between the two ridges and literally just squeezed the hammer handle and screwdriver together with one hand, amazingly after all my previous hammering, prying, sweating and swearing the cap immediately popped out a few mm, I turned the wheel 180 degrees and repeated the squeeze and the cap fell on to the floor, Job sorted!! Once again apologies if this is something already known but i was just so relieved to have found a way around this after much head scratching!! I still have an old puller tool. Looks like a big set of pliers. Clamps down. Wiggle wiggle off. It would be handy if you could post up the procedure for us newbies if you wouldnt mind? 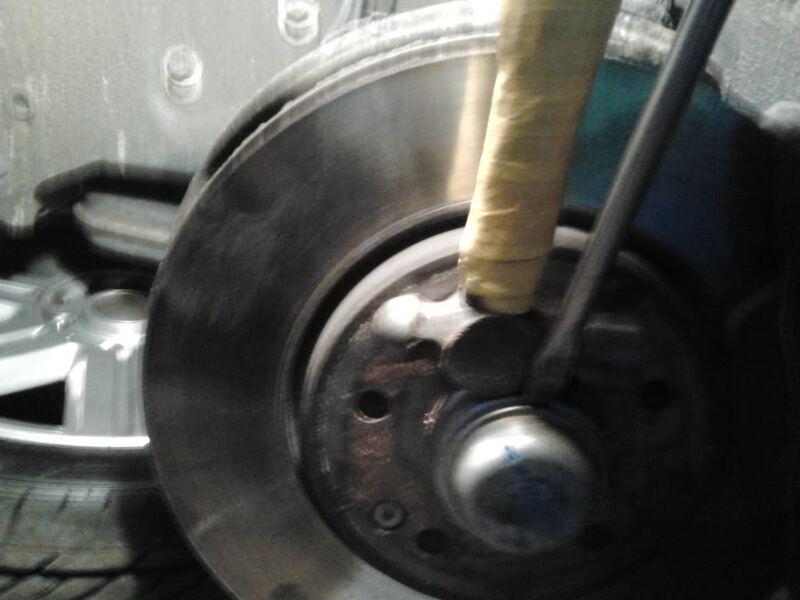 I followed info on the mercedes owners site, I frequent that forum too as I use an E class for business and the crossfire is MB running gear, but that thread contained a few differing opinions so I went partly with that and partly with my own experience of taper bearings and left a little play. It had gone through its UK MOT in December and the local test here on the IOM last week when I re-registered it both with no problems but I still felt there was a bit too much play, probably 1mm which i've taken down to about 0.5mm. Last edited by 11 FEB; 02-10-2013 at 09:45 AM. Does anyone know which tool this is? Is it specific for our cars? Last edited by Cedar11; 08-17-2014 at 10:53 AM. Installing is fairly simple, just offer them up nice and square to the flange and gently tap them squarely home, its getting them out which can be the difficult bit. Are you talking about re-installing the original caps or new ones? I have purchased new caps and the flange does not curve outward, so I am unsure how to install them at this point. Either new or original, if they are the correct ones for the car they should go in, they need carefully lining up and maybe a touch of grease around the leading edge, they should then go in so long as they are correctly lined up. Popping them in the freezer for a couple of hours first might help as they will shrink a couple of thou. Bosch crank position sensor, bosch camshaft position sensor, & oem gas cap 4 sale!! !